Your #1 Window Cleaning Company! Do you live in NY? We also serve Westchester. Click here to visit our site for this location. Have you heard? Fairfield County is in for an early Spring! Let the clean-up season begin! Have a lengthy list of home-improvement projects? What about the windows? With so much to do, you simply need hassle-free service from a professional company which fits into your budget. Thank you for selecting Fish Window Cleaning! "We were skeptical about the water-fed pole system but the results were AMAZING and the job was finished in a timely fashion"
To get started, call us at 914-481-5434 for a free, on-site estimate. Once approved, we can schedule service immediately. We clean the inside and outside, clean all screens and wipe all sills - it's that easy! No longer will you have to worry about cleaning up after your cleaners! Our cleaning staff will be wearing clean shoe covers on their feet and placing absorbent pads under each window and bucket in order to protect your carpets and wood floors. They will even introduce themselves to you before they begin cleaning your windows! Additionally, all Fish Window Cleaners have undergone a background check. They are all insured and bonded, and will arrive neatly dressed in full uniform. You will immediately witness the value that the courteous, experienced professionals at Fish Window Cleaning bring to your home! Call FISH at 914-481-5434 - Let us Brighten Your World TODAY! 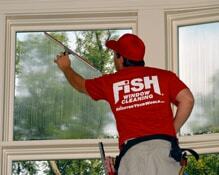 Fish Window Cleaning is committed to improving the appearance and value of your commercial storefront. In addition to free estimates, we provide window cleaning schedules ranging from weekly to annually, tailoring our services to the needs of your business. "When the Fish sales person called on us, we actually had a window cleaning service at the time. The erratic service and poor work ethic of the other service, who eventually stopped coming to clean our windows without even notifying us, led us to contact Fish." Regardless of your budget, we can put together a program for you. Our courteous, uniformed cleaning staff is trained to work during normal business hours while maintaining the utmost respect for your business and your customers. We’ve led the industry with a premiere safety program to ensure the protection of our customers and cleaners. We also provide the peace of mind that licensed, bonded, and insured window cleaners will be maintaining the cleanliness of your business. Call us at 914-481-5434 - We'll make your business shine! "There is nothing more cost effective to improve the appearance and showcase your home than to have your windows professionally cleaned." What to do...paint? Update the kitchen or bathroom? From the moment a prospective buyer pulls up to your home, they'll notice the windows first. We work with your realtor and home "stager" to make sure your home sparkles so its shows well and sells fast! Call FISH at 914-481-5434 - and make your first impression a good one!